I’ve been playing CFF for so long that I remember when Baylor owned the most explosive aerial assault in college football. From 2008-2014, the Bears employed a few of the best fantasy quarterbacks of the past decade: Robert Griffin, III, Nick Florence and Bryce Petty. It has been a few seasons since Baylor provided a weekly starter for CFF diehards. However, Charlie Brewer now ranks twenty-second among signal callers with 1,264 passing yards, 105 rushing yards, eight aerial strikes and three rushing touchdowns. He has scored more than 28 points in three of the past four games. At 6-foot-1 and 202 pounds, Brewer is an athletic, intelligent and precise passer who was named Big 12 Co-offensive Freshman of the Year by coaches last year. The Conference is defensively challenged, and the Bears are likely to be in weekly shootouts. A no-brainer purchase this week. 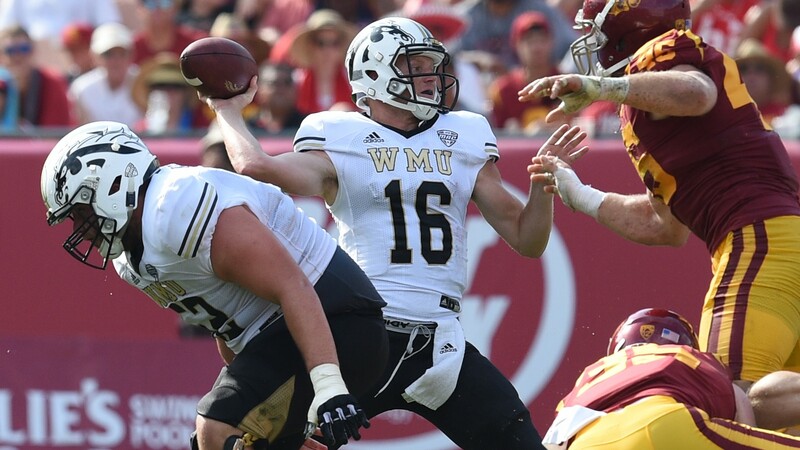 A starter as a red-shirt sophomore last year, Jon Wassink played in eight games and passed for 14 touchdowns, rushed for three and snatched two touchdown receptions before suffering a season-ending injury versus Eastern Michigan. Now healthy, the junior stands fifteenth among CFF signal callers, completing 62.9% of passes for 1,423 yards and 13 touchdowns. He has also gained 71 yards on the ground and rushed for two scores. The 6-foot-3 and 195-pounder recorded a prodigious 50.75 points versus Miami, OH on Saturday with 439 passing yards and five touchdowns. In four of the past five games, Wassink has scored over 22 points and his only clunker was at Michigan against the Wolverines. Well worth a waiver wire investment. For the past three seasons, I have not been interested in a Notre Dame quarterback. Coach Brian Kelly pulls the plug on his starting pitcher so often that it is difficult to invest in a Fighting Irish signal caller. Ian Book took over for Brandon Wimbush two weeks ago and must be considered as a CFF starter moving forward. In the past two games, Book has led Norte Dame to back-to-back victories over Wake Forest and Stanford. Connecting on over 70% of his throws, he has passed for 603 yards and six touchdowns. I expect the fantasy ownership will exceed 50% by kick off this weekend. It is not likely that a Rice player will become a fantasy star. Nonetheless, Austin Walter may be worth picking up this week. He is currently among the top fifteen running backs in CFF after scoring double-digit points (34.2 and 15.4) each of the past two weeks. At 5-foot-8 and 202 pounds, the senior is one of the best All-Purpose backs in college football. He leads C-USA in All-Purpose yards with 1,045. On Saturday, he totaled 165 rushing yards against Wake Forest and scored twice. In the past two games, he has 24 carries and six receptions for 286 yards from scrimmage. The Owls have back-to-back home games against UTSA and UAB, and Walter should continue to receive many touches each game. Another runner standing among the top twenty ball carries on the waiver wire after five weeks. With 48 carries for 279 yards and five touchdowns in the last two games, Ryquell Armstead is smoking hot and has four consecutive games over 100 rushing yards. 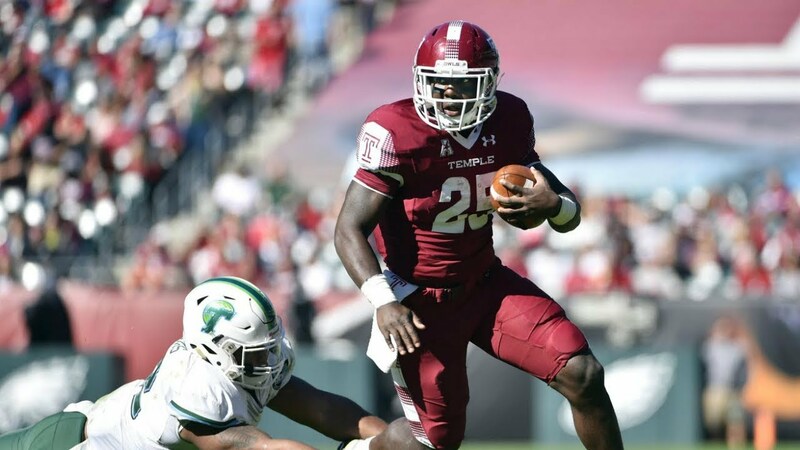 In 2016, the Temple dynamo burst onto the college landscape, scoring 14 touchdowns on 156 carries. Unfortunately, Armstead struggled with only 604 yards on 156 carries and five touchdowns last year. He is running the football with purpose and fury and must be corralled by CFF diehards this week. Very quietly, Fresno State employs one of the better offenses in college football, scoring 45 points and accumulating 440 yards a game. The majority of fans are likely focused on QB Marcus McMaryion and WR KeeSean Johnson while RB Jordan Mims has been unnoticed. He is twenty-seventh among CFF running backs after a 35-point performance against Toledo. In four games, the pass-catching playmaker has recorded 221 rushing yards, totaled 12 receptions for 207 yards and notched five touchdowns. At 5-foot-11 and 192 pounds, the sophomore sensation and the Bulldogs travel to Nevada next week, and Mims will shine again. Over the past two weeks, Riley Miller has been one of the most productive pass catchers in the nation. He has snatched 19 passes for 320 yards and a touchdown. The redshirt junior has already matched last season’s total receptions with 30 and averages 14.6 yards per catch. A walk-on at Ball State, teammates have nicknamed Miller the “GOAT” because he runs precise routes and catches every pass thrown his way. "I definitely wouldn’t consider myself the best of all time. Coach (Chevis) Jackson came up with it, and it just kind of stuck. This was years ago, and it just stuck. I roll with it," Riley stated. At 6-foot-1 and 196 pounds, Miller might not be the elite receiver that his nickname suggests, but CFF diehards should take notice of the rising celebrity at Ball State. It is not often that a Commodores wide out would rank among the top ten in the nation. However, Kalija Lipscomb has been one of the leading receivers, ranking eleventh with 120 fantasy points in ppr-scoring formats. At 6-foot-1 and 200 pounds, the junior playmaker has gained the confidence in his teammates. "I have a lot of trust in Kalija," quarterback Kyle Shurmur said. "Hats off to this guy for making a play." After five games, he has secured 43 passes for 480 yards and six touchdowns. CFF owners also need to embrace the Vanderbilt luminary. At this point in the season, he should not be available on so many waiver wires. I do not usually identify tight ends in the weekly Gemstones column, but Josh Oliver must be picked up across the hobby. Against Hawaii on Saturday, Oliver dominated the Rainbows with eight catches for 158 yards and a touchdown, averaging a mammoth 19.8 ypc. He has caught at least five passes in every game, recording 27 receptions in four contests. No tight end has been more productive in fantasy and remains accessible in over half of leagues. At 6-foot-5 and 250 pounds, Oliver is a nifty athlete who provides a big target in the middle of the field for the Spartans. The senior is one of my uppermost free agent recommendations this week.